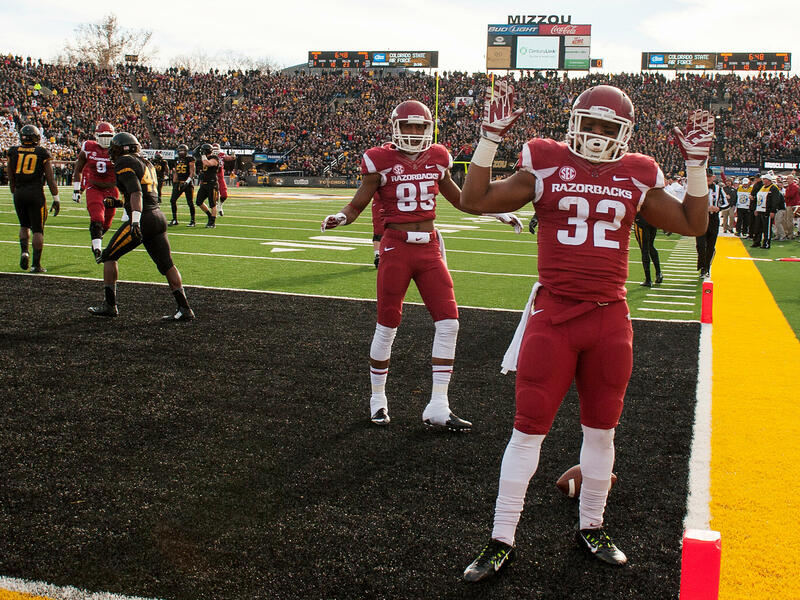 Arkansas running back Jonathan Williams had just scored a touchdown against Missouri last season when he dropped the ball and raised his hands in a hands up, don't shoot" gesture. In football, a sport that demands military-style discipline and singular focus, there's ample precedent for speaking out against the status quo. What happened at the University of Missouri in recent days, with African-American football players calling for a boycott with the support of coaches, is dramatic, but it's the kind of action that was quite common around 50 years ago, according to historian Lane Demas, a professor at Central Michigan University. "There's a three-year period of roughly 1967 to 1970 when there really was a wave of black football protest that coincided with kind of the general student movement on college campuses," Demas says. Demas wrote a book called Integrating The Gridiron: Black Civil Rights In American College Football. Demas says two late '60s protests were particularly significant. One in October 1969 at the University of Wyoming. "All 14 of the team's black players were dismissed by the coach, basically kicked off the team, because they wanted to wear armbands in a game against Brigham Young University, protesting discrimination at BYU and discrimination in the Mormon church," he says. Wyoming was unbeaten and ranked 12th in the nation when the so-called Black 14 were cut. The players sued and ultimately lost. Most left the university. Nearly a decade after the protest, the church changed the policy players had protested. But Demas says there was still a period of time when African-American athletes tried to avoid the University of Wyoming. The Black 14 became a rallying cry for other players — San Jose State athletes wore black armbands in solidarity. It had been two years earlier, says Demas, that the San Jose team was in the news for speaking out. "They pointed to racism in the campus Greek system at San Jose State, they pointed to racism at local businesses off-campus and they threatened basically to shut down the opening football game of the season," he says. But San Jose State's president beat them to it. He canceled the game, which The New York Times at that time called unprecedented: the first college game canceled due to racial unrest. Certainly big-time college football in the '60s wasn't the economic powerhouse it's become today. But Demas says the impact of the protests around 50 years ago shows college football was just as much a cultural force as the modern game. While Missouri isn't a watershed moment, it's important, he says, especially if it becomes part of a sustained organized movement — and there are indications it's not an isolated event. Last season, when Arkansas running back Jonathan Williams scored a touchdown against Missouri, he dropped the ball and raised his hands. The gesture was the "hands up, don't shoot" protest often seen after the shooting of Michael Brown in Ferguson, Mo. And there have been other instances of athlete activism, including the recent attempt by football players at Northwestern University to unionize. It's uncertain where these actions will lead. What is known: there's a strong connection to the past, when athletes exercised a power off the field as well. The football team at the University of Missouri was the most talked about part of a campus protest that helped force the school's president to resign. It shows the influence and economic power of today's big-time college sports. But, NPR's Tom Goldman reports, there's also a deep-rooted history of activism in college football. TOM GOLDMAN, BYLINE: It's ironic. In a sport that demands military-style discipline and singular focus, there's ample precedent for speaking out against the status quo. What happened at Missouri over the past few days is dramatic - African-American football players calling for a boycott with the support of coaches. A singular event, but the kind of action quite common 50 years ago, according to historian Lane Demas. LANE DEMAS: There's a three-year period of roughly 1967 to 1970 when there really was a wave of black football protest that coincided with kind of the general student movement on college campuses. GOLDMAN: Demas is a professor at Central Michigan University. He wrote a book called "Integrating The Gridiron: Black Civil Rights In American College Football." Demas says two late-'60s protests were particularly significant, one in October 1969 at the University of Wyoming. DEMAS: All 14 of the team's black players were dismissed by the coach - basically kicked off the team - because they wanted to wear armbands in a game against Brigham Young University protesting discrimination at BYU and discrimination in the Mormon church. GOLDMAN: Wyoming was unbeaten and ranked 12th in the nation when the so-called Black 14 were cut. The players sued and ultimately lost. Most left the university. Nearly a decade after the protest, the church changed the policy players had protested. But Demas says there was still a period of time when African-American athletes tried to avoid the University of Wyoming. The Black 14 became a rallying cry for other players. San Jose State athletes wore black armbands in solidarity. It had been two years earlier, says Demas, that the San Jose team was in the news for speaking out. DEMAS: They pointed to racism in the campus Greek system at San Jose State, they pointed to racism at local businesses off campus. And they threatened, basically, to shut down the opening football game of the season. GOLDMAN: But San Jose State's president beat them to it. He canceled the game, which The New York Times at that time called unprecedented, the first college game canceled due to racial unrest. Certainly big-time college football in the '60s wasn't the economic powerhouse it's become today, but Demas says the impact of the protests 50 years ago shows college football was just as much a cultural force as the modern game. While Missouri isn't a watershed moment, it's important, he says, especially if it becomes part of a sustained organized movement. And there are indications it's not an isolated event. GOLDMAN: When Arkansas running back Jonathan Williams scored this touchdown against Missouri last season, he dropped the ball and raised his hands. The gesture was the hands up, don't shoot protest often seen after the shooting of Michael Brown in Ferguson, Mo. And there've been other instances of athlete activism, including the recent attempt by football players at Northwestern University to unionize. It's uncertain where these actions will lead. What is known - there's a strong connection to a past when athletes exercised power off the field as well. Tom Goldman, NPR News. Transcript provided by NPR, Copyright NPR.